Emergency workers remove the 44-year-old tower tech who died after falling from an SBA Communications 160-foot monopole in Tulsa, Okla.
UPDATE: Nov. 7, 2016 – Services have been announced for Steven Lamar Hill, 44, of Chandler, Okla. by the Barnes Friedrich Funeral Home, 1820 South Douglas Blvd., Midwest City, Okla. beginning at 1:00 p.m., Nov. 9, 2016. 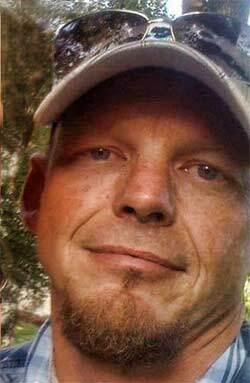 Interment will follow at Elmwood Cemetery in Choctaw, Okla.
UPDATE: Nov. 3, 2016 – Authorities have released the name of the deceased tower tech who fell from an SBA Communications monopole yesterday in Tulsa, Okla., Steven L. Hill, 44. 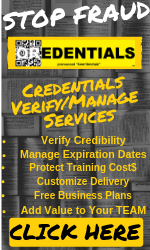 Local TV station FOX23 stated in a report that Hill’s employer, Mann’s Tower Services, had been issued three serious violations by Michigan OSH during an inspection in 2013. The company’s president, Jason Mann, acknowledged the citations to Wireless Estimator, but he said that they didn’t represent the company’s training and safety procedures in place for many years. The citations were for: Improper use of head protection; not providing a training program for each employee who uses a ladder; and for having an employee using a portable ladder and standing on the top 2 rungs or within 3 feet of the top of the ladder. The company has never been cited for improper training or improper use of fall protection equipment. Wireless Estimator will provide funeral services information when they become available. Both the Tower Family Foundation and the Hubble Foundation have reached out to Hill’s family to see if they can assist in their time of need. 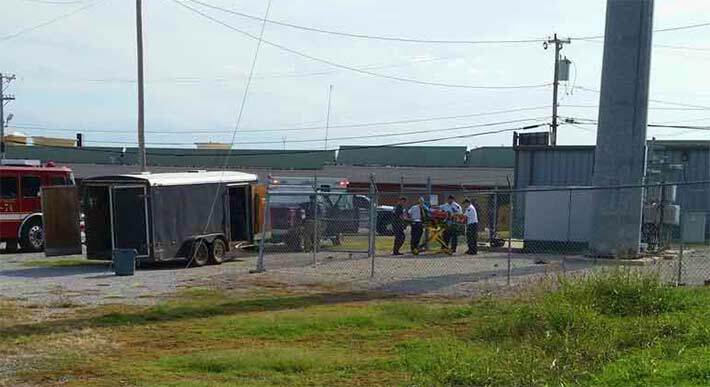 Update: Nov. 2, 2016 – According to Jason Mann, owner of Mann’s Tower Services, Inc. of Hermitage, Ark., the tower technician that died today worked for his company and he and his fellow employees are distraught upon learning of the incident. Mann informed Wireless Estimator that he could not release any additional information at this time, but said that he had contacted OSHA and is fully involved and cooperating with the investigation of the fatality in Oklahoma. Mann’s Tower Services was established in 2002 and has approximately 25 employees, according to the company’s web site that also identifies that they are a T-Mobile contractor, amongst other clients. Mann said he was not a subcontractor on the Tulsa project. 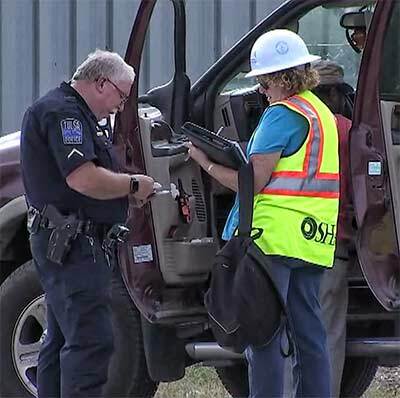 An OSHA inspector collects information from a Tulsa police officer. The fatality was the sixth industry death this year. Tulsa, Okla. firefighters say a 44-year-old tower technician is dead after falling from a 160-foot tall monopole at 27th and Memorial. Emergency crews were called to the area around 1:20 p.m. today. The worker’s death was the sixth fatality this year. A police spokesman said the man was working on the tower when he fell to his death. Officers spoke to a second tower tech who was present when his co-worker fell. They said it is early in the investigation, and they don’t yet know what caused him to fall or what safety precautions were in use. Authorities said that there were several witnesses that observed the incident. The tower is owned by SBA Communications. The worker’s name and his company have not been confirmed. Wireless Estimator will provide additional information as it becomes known.